In this case, oXygen has some built-in transformation scenarios we can use to process our ODD customization file. These scenarios are already set up with the XSLT file, XSLT engine, output, and action. So all we need to do is to associate the desired scenario(s) with the ODD customization file, and then tell oXygen to execute the associated scenarios. 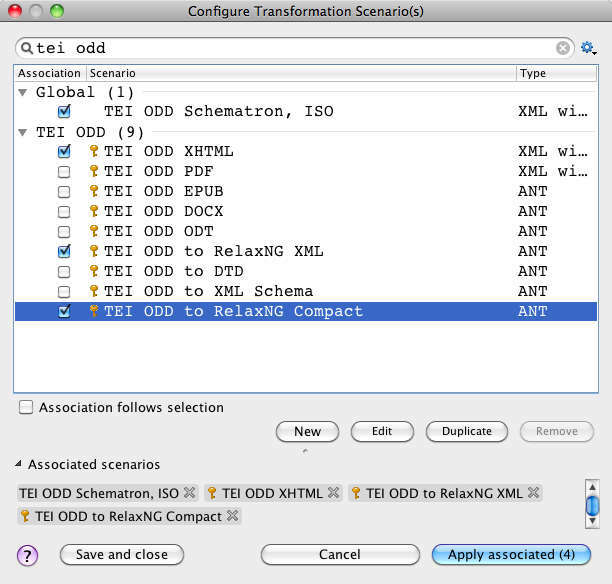 Press ⌘-⇧-c (⎈-⇧-c on Windows or GNU/Linux) or click on the “Configure Transformation Scenario(s)” button in the toolbar to set up the transformation scenario for your ODD file. All the transformations you selected will be run on the ODD file currently being edited. Several output windows will pop up in the lower part of the oXygen window, and XHTML (if any) will be opened in a browser. RELAX NG output will be saved into a subdirectory called out/. All this may take a minute or two. 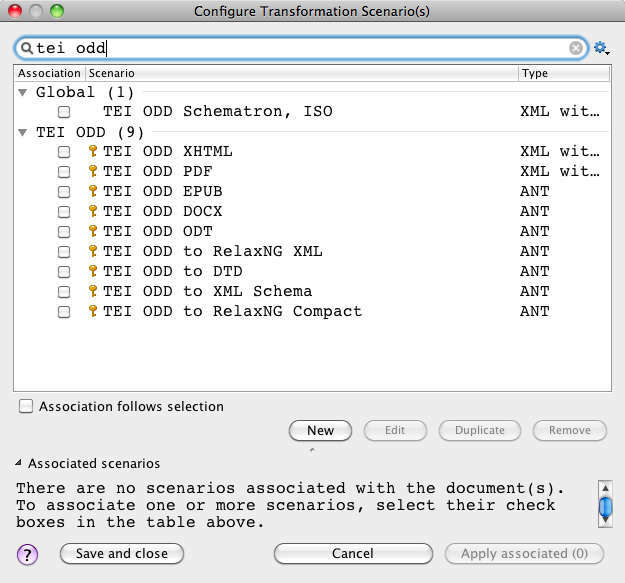 Hereafter you can run the selected scenarios on the ODD file currently being edited by pressing ⌘-⇧-t (⎈-⇧-t on Windows or GNU/Linux) or clicking on the “Apply Transformation Scenario(s)” button (a red triangle in a circle).